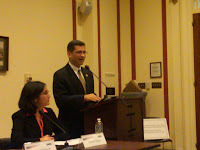 Left of the Hill: Rep. Xavier Becerra: "Divorce this conversation about deficit reduction from Social Security"
Rep. Xavier Becerra: "Divorce this conversation about deficit reduction from Social Security"
As conversations about Obama’s budget are progressing and the so called “Group of 6” senators (including Mark Warner) are meeting about how to implement the debt commission’s recommendations, there has been a lot of talk about what should be done in regards to social security. At a panel discussion last week sponsored by the Center for American Progress and other organizations looking at possible solutions, it became clear that this discussion should be held separately from the debate surrounding the president’s budget. 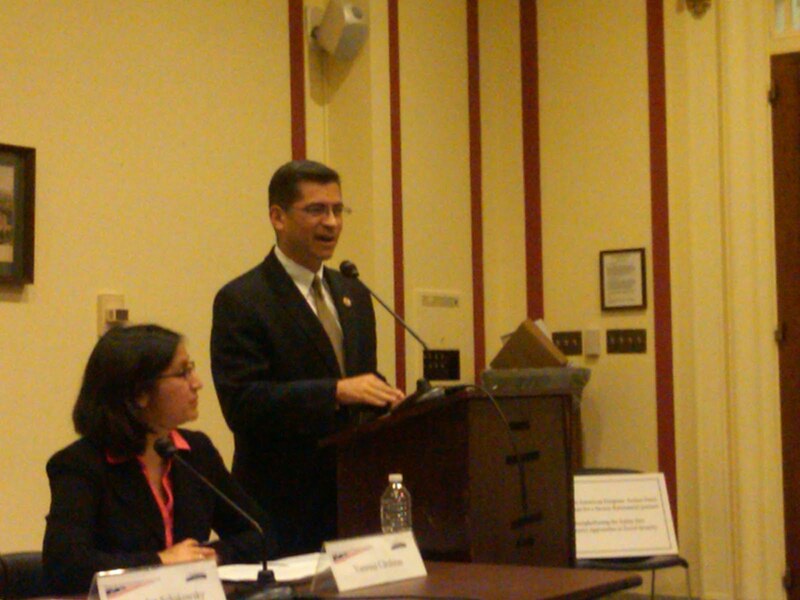 Rep. Xavier Becerra (D-California), the ranking member of the Ways and Means Committee’s subcommittee on Social Security, joined in other speakers in suggesting that social security is one of the most important programs that we currently have in place. In fact, he began his speech by saying that “by far, without question, there’s no program in the public or private sector that has done more for more Americans than has social security.” That is part of the reason why he believes we must stand up for social security while it’s under attack from people who are willing to cut it to save a few bucks. Although there are a lot of folks on the right who would like to blame social security for our deficits, Becerra was quick to point out how that argument is completely untrue. In fact, he even pointed out that without social security our deficits would be larger than they are currently. Social Security had not one single thing to do with causing the deficit that we’re confronting today. Not one cent of the money that’s owed, whether to China, or the US Banks, or to anyone else in this country or throughout the world by this government was used or borrowed by social security and social security recipients. In fact, were it not for the fact that social security is around and continued to run a surplus, the actual size of the nation’s budget deficits would be far larger in their perception. Because so much of the money that social security brings in from those of you who are working, and gets contributed to the system is above and beyond what we need today to payout benefits. And as a result, of course, the money goes into the trust fund. In addition to blaming social security for our country’s deficits, the GOP’s leadership frequently like to claim that we need to address our budget problems so that America’s youth aren’t straddled with enormous amounts of debt. What they fail to highlight, however, is that programs like social security are also one of the ways that America’s youth can be confident they have a solid future. That is why Becerra stressed the importance of making sure those of us under the age of 30 are actually paying attention to the conversation. The reality is that it’s mostly for young Americans that social security is so important. By the time you reach retirement age, which we hope doesn’t go much beyond what it’s supposed to be at 66 or 67 years, you’re pretty set. You’ve paid in. But when you’re 22, or 25, or 27. When you’re just embarking on your career and you’re not really thinking about what you’re going to be doing in 50 years. That’s when we want you to know you’re going to have a secure opportunity come your golden years. And so the reality is the debate about social security shouldn’t be about seniors. The debate about social security should really be about our youth. In other words, we really do need to see some changes in the conversation surrounding social security. No longer should it be viewed as a program that’s increasing our deficits while only looking out for the interests of the seniors currently receiving benefits. Instead, the conversation should focus on the reality that social security is a program that is crucial for our country’s younger population and has been running a surplus. When you no longer are buying into the myths that folks on the right are promoting about social security, then you can finally begin to talk about the reforms that might need to be implemented down the road.